Expansion sets have become an integral part of the gaming experience. Whether they offer new wrinkles to an established game, allow you to add additional players, or create new ways to use the same game pieces, they revitalize games that might’ve become less fun or interesting after lots of play. It’s difficult to strike a balance with expansion sets, since they must respect the game that came before and add to it in a meaningful way, but without introducing any game-breaking mechanics or otherwise compromising what made the original game fun in the first place. The designers at Looney Labs are absolute pros when it comes to balancing their expansion packs. Each one enhances the gameplay without sacrificing any of the original game’s clarity or cohesiveness. In the past, we’ve looked at Looney Labs expansions like Fluxx Dice (which add further mayhem to an already chaotic game of Fluxx), the Just Coffee and Better with Bacon expansions for Just Desserts (which add new dishes and characters to deepen gameplay options), and the Bridge Expansion for Star Trek Fluxx and Star Trek: The Next Generation Fluxx (which allow you to combine both games into one). Today, we’re looking at an expansion pack for one of the company’s most immersive and challenging puzzle games: Zendo. 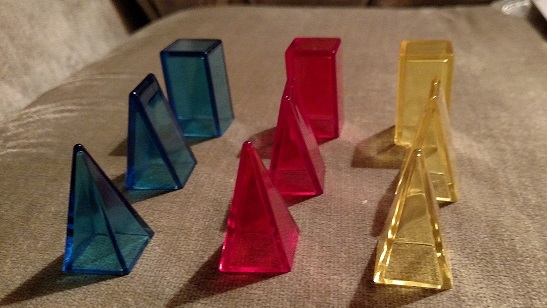 In Zendo, the players pull pieces from a communal pile in order to build different structures, using pyramids, wedges, and blocks. One player, the moderator, chooses a secret rule for the players to uncover, and builds two structures. One of these structures follows the secret rule, and one does not, and both are marked as such. Secret rules can be as simple as “must contain all three shapes” or “must contain exactly four pieces.” They can be as complex as “must contain more blue pieces than blocks” or “must contain at least one yellow piece pointing at a blue piece.” Some rules involve how pieces touch, or how they’re stacked, while others demand no touching or stacking whatsoever. The field is wide open at the start of the game. Players then try to deduce the secret rule by building structures themselves, arranging pieces from the communal pile into various patterns and asking the moderator for more information. 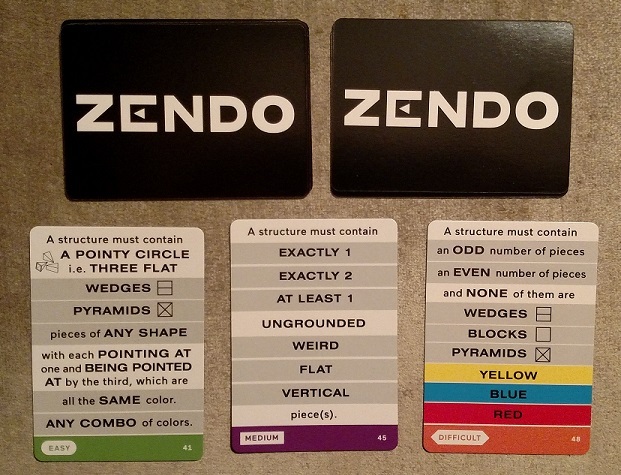 So, how does the Zendo Expansion affect the original? 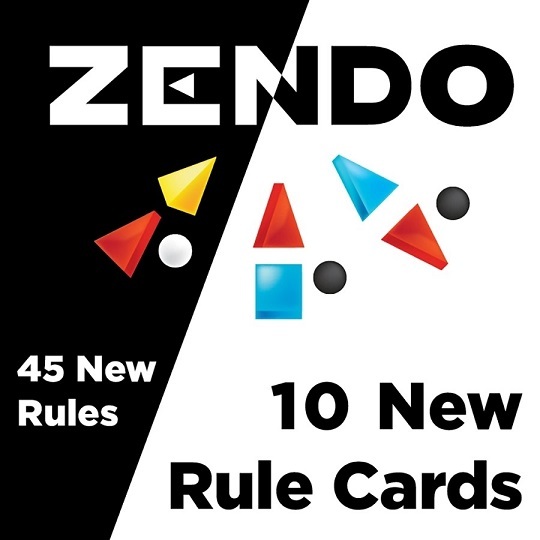 The Zendo Expansion is a ten-card deck of new secret rule cards that allow the moderator to create more complex and challenging structures for the other players to unravel. But these ten cards offer much more than just the rules themselves. They encourage both the moderator and the players to be more creative, considering not just the shapes and how they interact, but the overall look of the structure. One of the cards requires players to shape the structure’s shadow into a given shape. 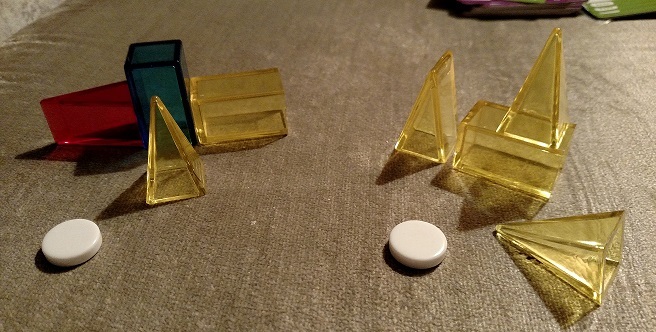 Moving beyond the pieces themselves and incorporating the light and shadow of the play area is a clever and unexpected way to use the Zendo pieces. It immediately sends your brain in new directions, both as a player trying to deduce other secret rules in later game sessions and as a moderator looking for new ways to prove or disprove players’ theories with your own builds. Not only does the Expansion deck add all sorts of new twists on the original game, but it makes you want to be more ambitious and clever in your guesses and structures the more you play. With new rule cards ranging from easy to difficult, players of all skill levels will benefit from adding this set of cards to their puzzle game arsenal. Zendo and the Zendo Expansion are available from Looney Labs, and both are featured in this year’s Holiday Puzzly Gift Guide! This entry was posted in Games, PuzzleNation, Puzzles and tagged better with bacon, bridge expansion, bridge expansion pack, deduction, DIY puzzling, expansion deck, expansion set, Fluxx Dice, games, Geeking Out, Holiday Gift Guide, Holiday Puzzly Gift Guide, Holidays, just coffee, Just Desserts, logic, logic problem, logic puzzle, Looney Labs, Looney Pyramids, Pop culture, product review, PuzzleNation, Puzzlin' fool, Puzzly Gift Guide, Star Trek, star trek fluxx, Star Trek: The Next Generation, Star Trek: The Next Generation Fluxx, Thanksgiving, Zendo, zendo expansion by gmdirect. Bookmark the permalink.